I love your, what I assume is, predictive text error… Attitude indicator, instead of altitude indicator. I thought you were being clever with words. I kept waiting for the punch line. LOL! Haha, nope, not an error. The attitude indicator is actually one of the most important instruments on the plane. It tells you the attitude of the plane (i.e. the angle of the plane to the horizon) so you use it to tell if you’re in straight and level flight. It’s important if you have spacial disorientation in a cloud and your feelings tell you that you are turning when you’re not, you rely on that instrument to keep the plane straight. The altitude indicator is actually referred to as the altimeter. 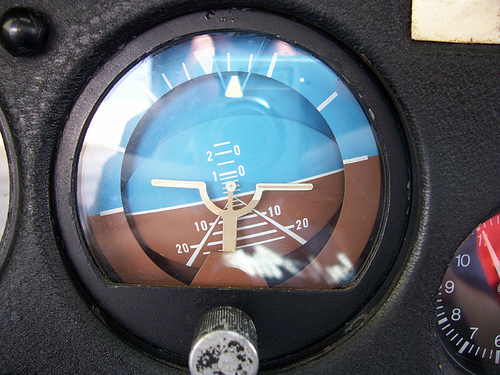 You can see what an attitude indicator looks like here: http://content.artofmanliness.com/uploads/2008/09/2064910616_b462c1db29.jpg that one is turning. Ooo, fingers crossed for your first solo cross country here in Alaska too! If you ever do aerobatics, you’ll have to get used to the attitude indicator taking a break 😛 Good luck on your first solo cross country, I’m sure you’ll do fine.